*Required fields Country*ColombiaUnited StatesAlbaniaAlgeriaAmerican SamoaAndorraAngolaAnguillaAntigua and BarbudaArgentinaArmeniaArubaAustraliaAustriaAzerbaijanBahamasBahrainBangladeshBarbadosBelarusBelgiumBelizeBeninBermudaBolivia, Plurinational State ofBonaire, Sint Eustatius and SabaBosnia and HerzegovinaBrazilBrunei DarussalamBulgariaCabo VerdeCambodiaCameroonCanadaCayman IslandsChileChinaColombiaCook IslandsCosta RicaCroatiaCubaCuraçaoCyprusCzechiaDenmarkDominicaDominican RepublicEcuadorEgyptEl SalvadorEquatorial GuineaEritreaEstoniaEthiopiaFalkland Islands (Malvinas)Faroe IslandsFijiFinlandFranceFrench GuianaFrench PolynesiaGeorgiaGermanyGhanaGibraltarGreeceGreenlandGrenadaGuadeloupeGuamGuatemalaGuyanaHaitiHondurasHong KongHungaryIcelandIndiaIndonesiaIran, Islamic Republic ofIraqIrelandIsle of ManIsraelItalyJamaicaJapanJerseyJordanKazakhstanKenyaKorea, Republic ofKuwaitLatviaLebanonLiechtensteinLithuaniaLuxembourgMacaoMacedonia, Republic ofMalaysiaMaldivesMaltaMartiniqueMauritaniaMexicoMonacoMongoliaMontenegroMontserratMoroccoMozambiqueNamibiaNetherlandsNew CaledoniaNew ZealandNicaraguaNigeriaNorwayOmanPakistanPalestine, State ofPanamaParaguayPeruPhilippinesPolandPortugalPuerto RicoQatarRomaniaRussiaRéunionSaint BarthélemySaint Kitts and NevisSaint LuciaSaint Martin (French part)San MarinoSaudi ArabiaSenegalSerbiaSingaporeSint Maarten (Dutch part)SlovakiaSloveniaSolomon IslandsSouth AfricaSpainSri LankaSurinameSwedenSwitzerlandTaiwan, Province of ChinaThailandTrinidad and TobagoTunisiaTurkeyTurkmenistanTurks and Caicos IslandsUkraineUnited Arab EmiratesUnited KingdomUnited StatesUruguayVenezuelaViet NamVirgin Islands, BritishVirgin Islands, U.S.
You already added the maximum quantity for this product/reference in your cart. If you wish to buy more, please contact us. How to purchase online for wholesale ? If the product is shown with a wholesale price, just add it to your shopping cart. In the cart, when all products of that line/manufacturer reach a minimum they will be shown with wholesale prices in red color (a product line is identified by the first two letters of each product reference, ie. AN). To buy just continue to checkout. Or please contact us with a list of quantity for each reference you wish to purchase. You can buy for retail AND wholesale. Products that reach the minimum for wholesale will be shown in the shopping cart in red color. 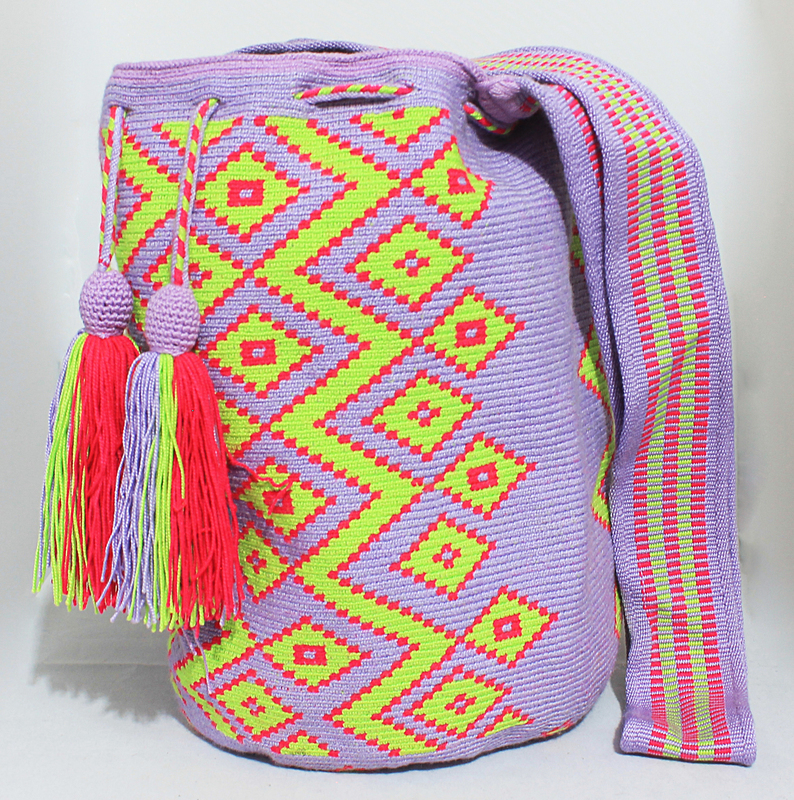 Colombian Wayuu Mochila, one cotton thread. Handmade by women of the Siapana community north of Colombian Guajira. Strip made in manual loom. This model available for shipping in 2 - 3 business days. Size 22 x 29 cm. View large picture.